The Denver Basin aquifer system is a critical water resource for growing municipal, industrial, and domestic uses along the semiarid Front Range urban corridor of Colorado. The confined bedrock aquifer system is located along the eastern edge of the Rocky Mountain Front Range where the mountains meet the Great Plains physiographic province. Continued population growth and the resulting need for additional water supplies in the Denver Basin and throughout the western United States emphasize the need to continually monitor and reassess the availability of groundwater resources. In 2004, the U.S. Geological Survey initiated large-scale regional studies to provide updated groundwater-availability assessments of important principal aquifers across the United States, including the Denver Basin. This study of the Denver Basin aquifer system evaluates the hydrologic effects of continued pumping and documents an updated groundwater flow model useful for appraisal of hydrologic conditions. Head observations, site location information, and simulated equivalents for the Denver Basin model. Paschke, S.S. 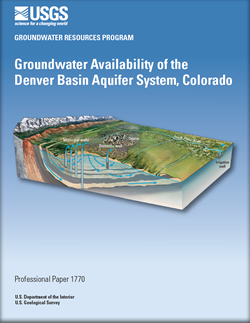 ed., 2011, Groundwater availability of the Denver Basin aquifer system, Colorado: U.S. Geological Survey Professional Paper 1770, 274 p.